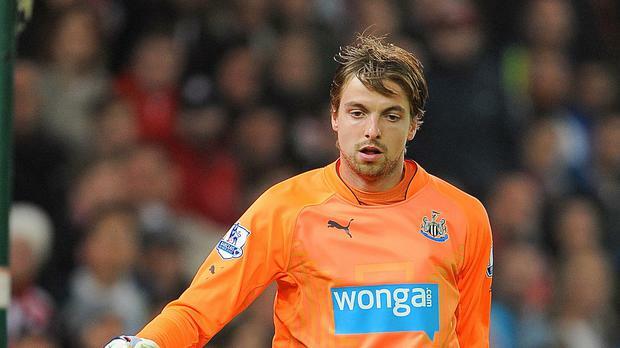 Newcastle expect Tim Krul to be fit for Saturday's Barclays Premier League game against Leicester after the goalkeeper suffered a " very minor elbow injury" while training with Holland. The 26-year-old sustained the problem on Saturday and returned to Tyneside before the Oranje's shock 2-0 loss in Iceland. Scans on Monday showed ligament damage, the club revealed on Wednesday morning, before declaring on Wednesday afternoon that he should be in contention this weekend. "Tim Krul has been further assessed today by the club's medical staff and the club can confirm that he has nothing more than a very minor elbow injury," a Newcastle statement read. "The club will continue to monitor the situation but are confident that he will be available for the game against Leicester City on Saturday." Alan Pardew's side will be continuing their pursuit of a first Premier League win of the season when the Foxes visit St James' Park on Saturday.